Notifications & Device Screens & more with release 3.10! Push notifications now include device names (!) and those notifications will drive to the home screen of that specific controller. 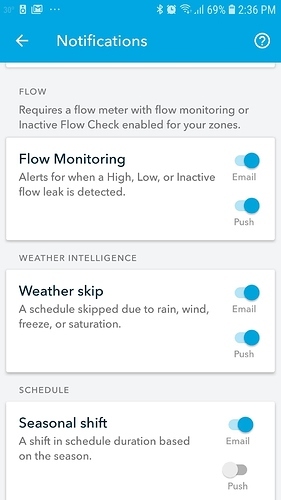 Flow monitoring alerts can now be customized in settings. 3.10 also includes some secret groundwork for an upcoming feature for our Flow customers Stay tuned! Here are a couple screenshots with the new notification settings (Flow monitoring and sharing shared access emails). Nice additions! 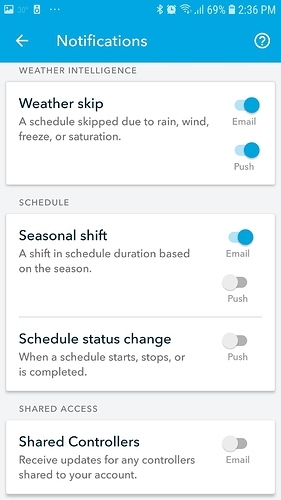 Any samples of what the updated incoming push notifications with controller name look like? We’re in standby until next year yet still curious. Love the new Watering animations on the devices screen! Nice! Thank you so much for sharing a screenshot @tmcgahey! That was on my list of to-do’s for today! THE RACHIO GODS HAVE SPOKEN! @laura.bauman, I’ve actually been getting the notifications with controller name for a few weeks…was there some other update that brought that about? @tmcgahey - kind of! Our server pushed it out a little early since the feature is not dependent on an app update but instead dependent on the server. Kudos to the server team.